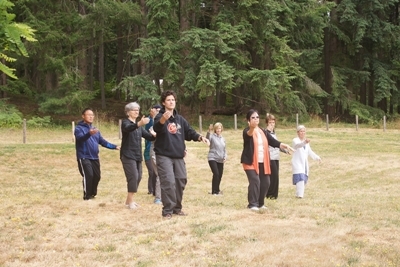 TAI CHI IS SELF CARE by Edna Brandt LAc Licensed Acupuncturist and Tai Chi Teacher Contributions from Will Fudeman, Acupuncturist ~ (Nov 2018) | Tai Chi Foundation Inc.
Here’s a thought: we can stop doing this to ourselves. We can take care of ourselves by bringing our attention to our own bodies. We are alive, and the life force is constantly moving through every cell of our bodies. When we bring our attention to the aliveness in every part of ourselves, we can change our experience of being alive. Tai chi practice offers an easy form of self-care. For those of us who find it difficult to sit in meditation, the slow, graceful movements of tai chi practice allow the mind to focus on appreciation of every part of our bodies, and the ways we receive and send out energy constantly as we interact with everything around us. Other people will continue to say and do things we don't appreciate. We will experience negative feelings again. But, while we are practicing tai chi, we don't need to give those negative feelings our attention. We can choose to let negativity go, because we are focused on caring for ourselves, for every cell in our bodies. We can let go of what troubles us as we practice appreciation and caring for every living aspect of who we are. Give tai chi daily practice a try…take the time to care for yourself.